This is my version of the popular Chinese scallion pancake, the modern and simplified way. 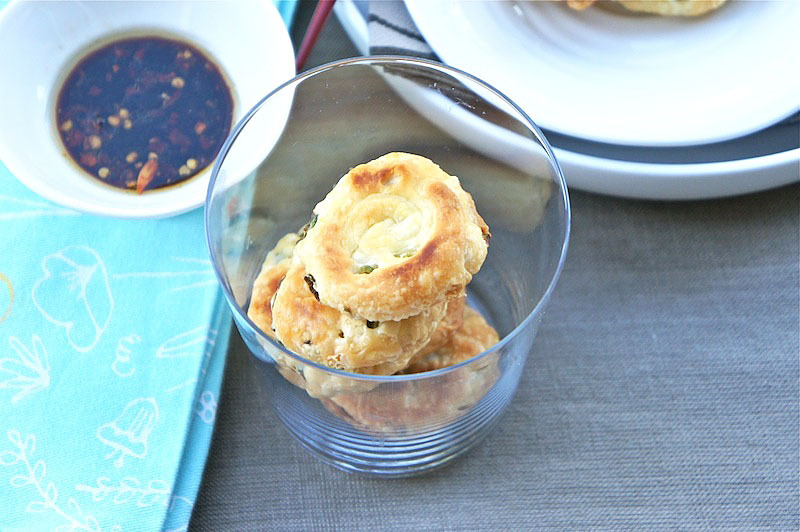 Instead of the traditional flour dough, these Mini Scallion Puffs were made with store-bought puff pastry. 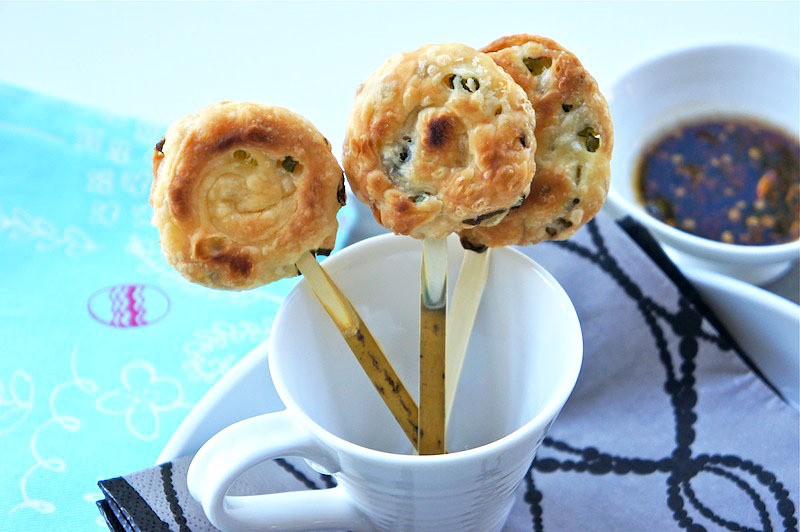 Put a generous sprinkling of scallions and sea salt on the pastry and then baked in the oven until golden light brown. These mini puffs will turn out tasty, crunchy, and makes a great in-between meal snack. Preheat the oven to 400˚F. Line a baking tray with parchment paper. 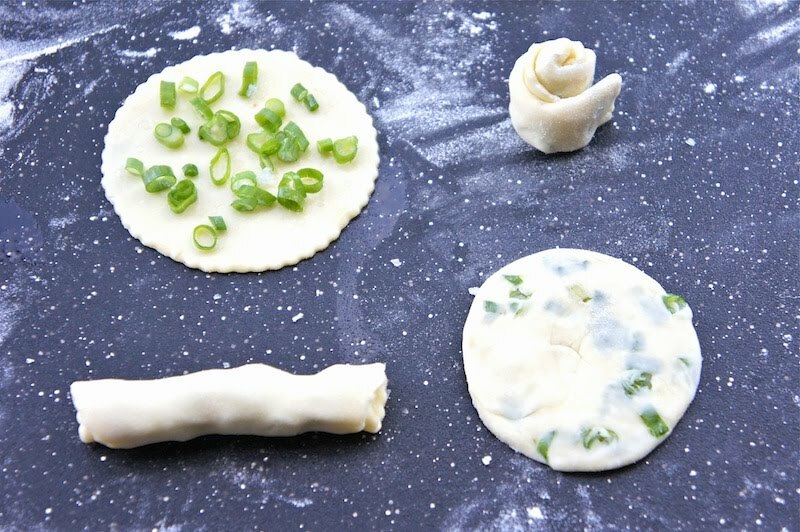 On a lightly floured surface, unfold the puff pastry and cut into circle with a cookie cutter. You will have about 18 pieces. Work with one piece at a time and brush the surface with sesame or peanut oil and sprinkle with scallions and sea salt. Starting with the edge closest to you and roll up the dough. Then roll it up again from one end like a snail and flatten the roll with your palm. Repeat with the remaining pastry, oil, scallions, and sea salt. Bake for about 8 to 9 minutes, turn the pastry over, and continue to bake for another 5 minutes, or until golden light brown in color. Remove from the oven and let cool slightly before serving with dipping sauce, if desired. This looks yummy and easy to make as well.I have been looking for a starter recipe for a party this weekend, Maybe I will make this for this weekend's party at my house. Thanks for sharing.